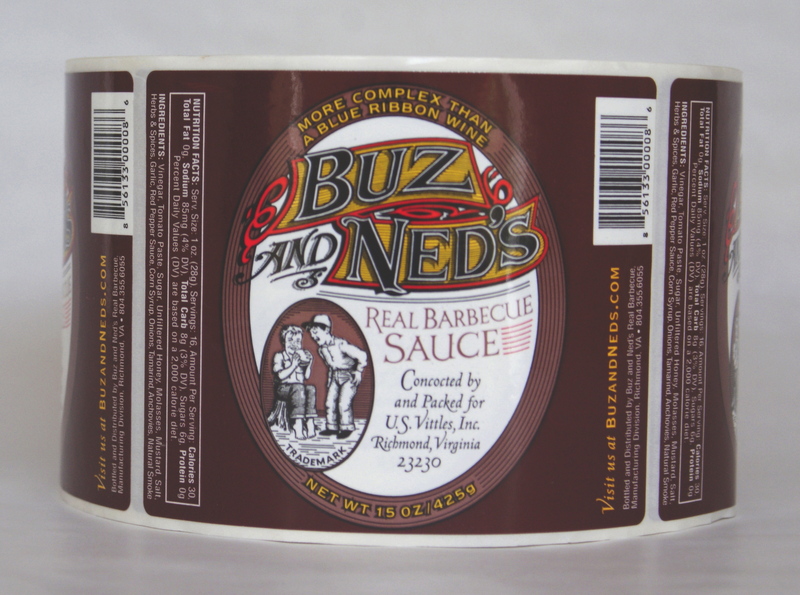 Custom printed food labels can spice up the look of your barbecue sauce. Did you know that May is National Barbecue month? With all of the brands of barbecue sauce out on the market, how will you make your products stand out? Your custom printed label by Renell will spice things up. For over 40 years, we have been manufacturing sauce labels for both small and large companies. Some of our customers prefer the more simple approach of a one-color label with an eye-catching logo. They highlight their brand and the item name, and that works fine for them. Other customers prefer a multi-color label that not only highlights their brand, but also allows them to really stand out from the crowd (especially if the product is sold in large markets). Either way, Renell Label-Print will help you get the look you want! Looking for a barbecue label that shimmers? Why not use a custom printed foil label? You can make the “HOT” part of your hot sauce look as though it’s on fire. Are you looking for a label for the more “down to earth” customer? Maybe a more simple label on brown kraft is the right choice for you. Perhaps you prefer a clean white label with a simple look to it. We can work with you to maximize the look of your custom printed food label. Just Getting Started With Your Product Line? At Renell, we have worked with smaller vendors to help them create a label that looks professional. We believe that the label you put on your package helps sell the product. Our custom printed food labels can be seen not only in supermarkets, but also in smaller markets and farmers markets. We take great pride in what we do. Nothing makes us happier than to see our hard work (and yours) result in a first class custom printed label that helps you sell your product. So we hope you enjoy your National Barbecue month. Remember- when you use barbecue sauce for your grilling, the label on the bottle just might be one we made here at Renell!! Enjoy!